The Division of Agro-environmental Research focuses on climate change, soil management, plant pathology and entomology, and plant nematology in the context of establishing sustainable agriculture in Hokkaido. 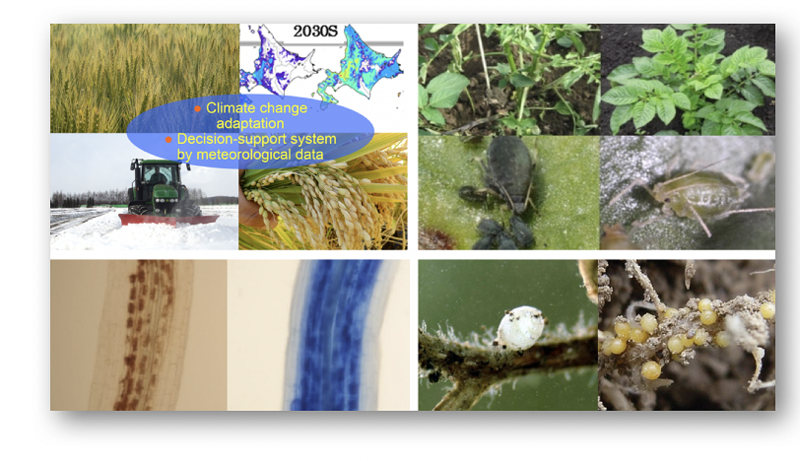 The Climate Change Group is carrying out research for the development of an information decision-support system for agriculture corresponding to climate change in Hokkaido and the development of technology to support the introduction and stable production of new crops. The Soil Management Group is conducting research on the development of soil management and diagnostic technology to support labor-saving and stable production in large-scale upland and paddy field crop production system, development of resource conservation stable production technology using Arbuscular Mycorrhizal Fungi, and development of warming mitigation technology in agricultural lands. The Plant Pathology and Entomology Group is carrying out research for controlling plant diseases caused by bacteria, fungi and plant viruses, and damages from insect pests, e.g. aphids from the viewpoint of fundamental research such as disease epidemiology, elucidation of the mechanism of infection and viral transmission, investigation of natural enemies, diagnostic techniques of diseases. The main subjects currently implemented in the group are potato blackleg, potato mosaic, and beet western yellows that can seriously inhibit production in large-scale upland farming in Hokkaido. The Plant Nematology Group is conducting research for the development of integrated nematode management to prevent significant loss of crop yield and quality caused by plant-parasitic nematodes in large-scale upland farming in Hokkaido. We carry out studies such as elucidating biology, ecology and epidemiology of those nematodes, developing high-precision detection technology, developing practical and effective control measurements, and establishing a system that leads to eradication of the newly-risen nematodes, especially potato cyst nematodes infesting potato.